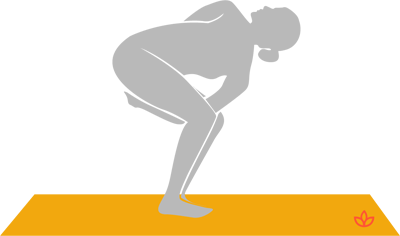 Definition - What does Bound Revolved Chair Pose mean? Bound revolved chair pose is an intermediate standing twist. It's Sanskrit name is parivrtta baddha utkatasana. From chair pose, the torso twists to the right or left and the lower arm threads between the legs to reach the opposite arm around the back and clasp the wrist. The gaze is up toward the sky. The pose is held for a cycle of six to eight breaths then repeated on the opposite side. Preparatory poses for bound revolved chair pose include chair pose, revolved chair pose and noose pose. Those with neck pain may keep the gaze forward rather than toward the sky. For a deeper expression of the pose, the heels may be lifted off the ground.